President Lou Anna K. Simon speaks as the MSU Board of Trustees meet on Sept. 8, 2017 at Hannah Administration Building. The next meeting will be on Oct. 27. If a house is on fire, you don’t stay inside. You call the fire department. You put the fire out and then, after mourning the loss and reparations are made, you rebuild. MSU, your house is on fire. It’s been on fire. Slowly, MSU is trying to put the fire out. But, once it’s out, there will be ugly remnants. The MSU of old won’t resemble the MSU of new. As much as people want to say that’s a bad thing, it isn’t. The strongest this institution will ever be is during a period of new life. There is only one way to build this new house, and the people who claim to love it need to understand that. President Lou Anna K. Simon, we now speak directly to you. Whether or not you admit guilt in this storyline, you need to do the right thing. Survivors of ex-MSU and USA Gymnastics doctor Larry Nassar’s sexual abuse cannot move on without change. You “apologized” to them, you have thrown money at them, but about the only thing you haven’t done is listen. Simon, if you’re the Spartan you claim to be, you will step down and bow out gracefully. We hope you make the right choice, because time’s up. Now, to those who hide behind Simon, her cheerleaders and appointees, the enablers, you aren’t excused from this story. By allowing this serial predator to practice on campus, each and every one of you is just as guilty as Nassar. Every one of you was entrusted to instruct and protect children and young adults. Every one of you completely violated that trust. Four years ago was the first official investigation of Nassar. MSU knew in 2014. MSU knew Nassar was victimizing women and girls. We know this because “policies” were instituted to prevent abuse from happening again. But those “policies” enacted were not enforced. And when Nassar was told to have a chaperone in the room during treatments following the investigation, no steps were taken to make sure those rules were being followed. Nassar abused women and girls under the eye of MSU up until September 2016, when IndyStar published a story revealing Nassar’s abuse for the first time. It was only then, under the pressure of the public eye, that MSU fired Nassar. But don’t think for a second MSU wasn’t involved. A monster like Nassar doesn’t happen alone. Look at the facts: members of MSU faculty, coaching staffs and more knew about allegations against Nassar as early as 1997. An investigation didn’t happen until 2014, and MSU cleared him. And what did MSU provide for the survivors? Scripted apologies, empty promises, a PR website and a $10 million fund for counseling services, a fund named after the Board of Trustees that has made little progress. By all accounts, MSU did nothing, and continues to do nothing. And the lack of transparency on anything related to Nassar is astounding. 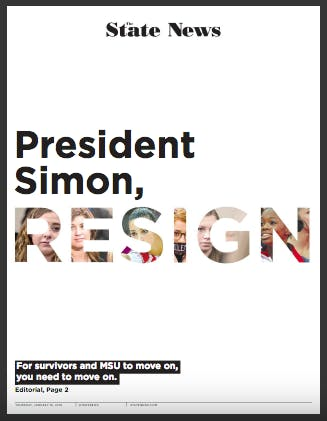 It’s MSU’s job to be clear and honest with angry students, faculty, alumni and survivors, and no one at MSU can even admit they were wrong two years ago. Can’t get in trouble if you don’t say anything, right? Wrong. It’s too late, MSU. You’re not escaping this one. In September 2016, we were shocked when just a few allegations came out against Nassar. ‘President Simon has to say something about this soon, right?’ We thought. Simon’s first statement came five months later, February 2017. Since then, we have learned just how widespread Nassar’s abuse spans. Since then, there are more than 140 women and girls who have come forward. He had influence in schools, churches, local gyms, Olympic and national gyms. Who knows how many more are out there, still hurting too much to do the same? 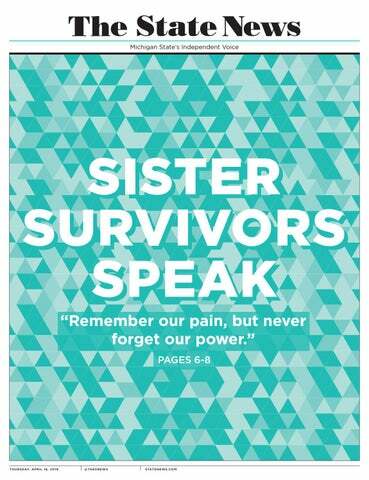 If MSU had only listened to the women and girls from the beginning, things would be different. Dozens of women and girls would not have to stand in the courtroom, reopening old wounds as they detail their abuse in an effort to find justice. It’s these women and girls, who survived avoidable trauma at Nassar’s hand, who put a serial child molester behind bars — not anyone at MSU. Some of the people who enabled Nassar to hurt so many women and girls are still at MSU. They felt their job security or the university’s public image were more important than the physical safety and emotional health of women and children. All enablers at MSU need to resign. It’s the only step toward rebuilding the public’s trust. If enablers continue to work at MSU, there will be little change. The cycle will run again and another sexual predator will ascend into the darkness that shrouds this university. You can ignore this editorial, but like the women and girls sharing testimonies in court this week, we will persist. That destruction is only beginning. The State News Editorial Board is made up of the Editor-in-Chief Rachel Fradette, Managing Editor McKenna Ross, Campus Editor Madison O’Connor, City Editor Souichi Terada, Features Editor Sasha Zidar, Sports Editor Jonathan LeBlanc, Inclusion Representative Maxwell Evans, Staff Representative Marie Weidmayer and Copy Chief Casey Holland. Editor-in-Chief Rachel Fradette and Campus Editor Madison O’Connor did not vote during this editorial meeting. A previous version of this story stated they did not sit during the meeting, but they did.